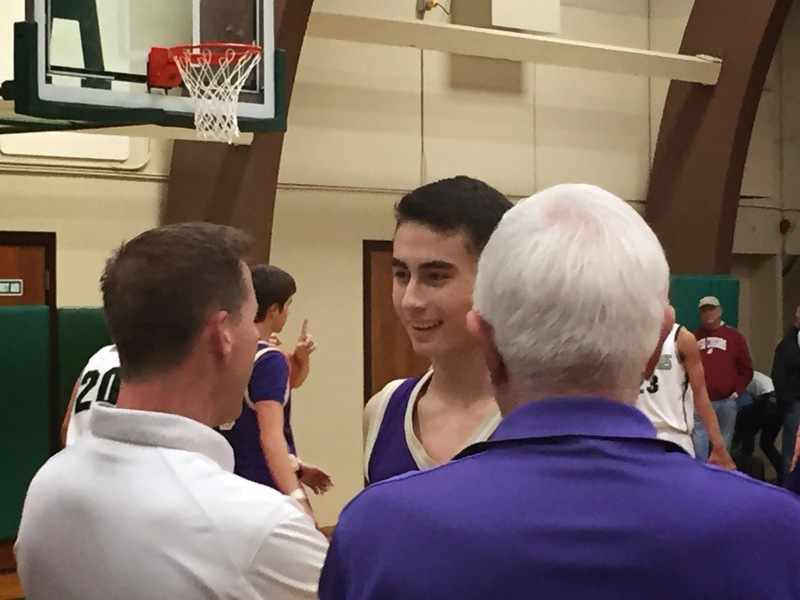 Sequim senior Alex Barry gets congratulations from Coaches Greg Glasser and Phil Langston, as he leaves the court in the final minute of Sequim's 48-37 triumph at Port Angeles. Barry had 18 points. (Port Angeles) -- A 25-6 Sequim spurt in the first 13 minutes proved the difference in Friday's Rainshadow Rumble boys basketball game with the Port Angeles Roughriders. The Wolves came up with their eighth consecutive victory over their archrivals, 48-37 at the Rider Gym, as the Roughriders could never catch up after the slow start. A smothering Sequim 2-3 zone defense held Port Angeles to just one basket in the opening quarter -- a hoop by Hunter Hathaway with 3 seconds left -- as the Wolves led 14-2 at the first buzzer. Crisp Sequim ball movement in the opening frame led to 7 points from Alex Barry, who was the game-high scorer with 18. Vance Willis completed a three-point play with 2:54 to go in the first half that gave the visitors a 25-6 advantage. The Roughriders ended the half on a 8-2 run, fueled by triples from Noah McGoff and Grayson Peet, that cut the Wolves halftime lead to 27-14. 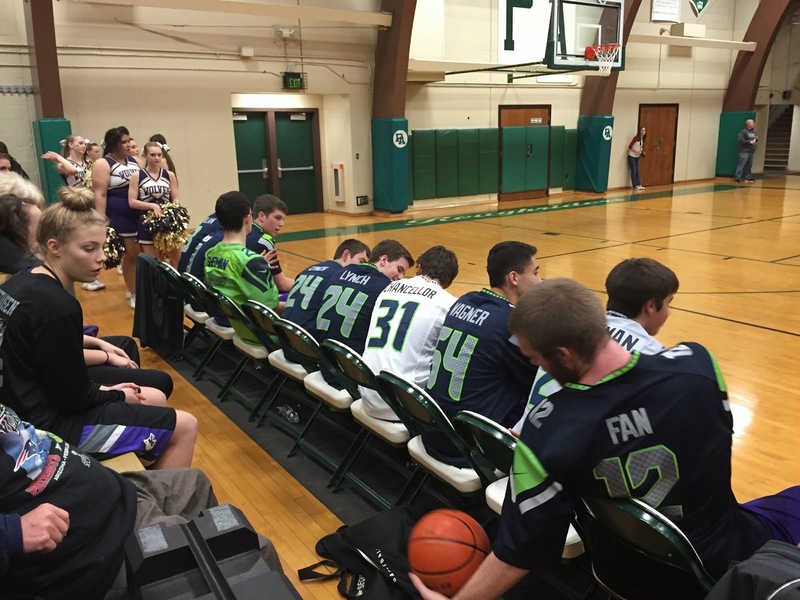 The teams traded baskets in the third quarter, Jackson Oliver scoring 5 of his 9 points for Sequim and the Riders' Lambros Rogers had 6 of his 8 markers in the period. The Wolves went to the final stanza ahead 39-25. Sequim senior Vance Willis launches a triple that swished through the net to give Sequim a 39-25 lead after three quarters. Sequim pulled ahead by 14 at 42-28 with 4:44 remaining when Barry had a steal resulting in a crowd pleasing two-handed slam dunk. Port Angeles remains in a tie for fifth in the Olympic League 2A Division standings at 2-8 (5-13 overall) with Kingston and North Mason. Olympic beat Kingston 58-54 Friday and Bremerton downed North Mason 53-41. PA has the tiebreaker over North Mason with a 2-0 sweep in league action and the Riders meet Kingston in the league finale next Friday night. Kingston beat PA 57-52 in the first meeting of the squads on January 14th. PA travels to Bremerton Tuesday night facing a must win situation. Sequim remains in third place in the league standings at 8-3 (13-6 overall), a game behind Olympic. The Wolves play their regular season finale Tuesday night at Rick Kaps Gym against the league-leading North Kitsap Vikings. Sequim (48) -- Dusty Bates 3, Payton Glasser 4, Alex Rutherford 3, Vance Willis 7, Jackson Oliver 9, Adrian Espinoza, Josh McConnaughey 4, Alex Barry 18. Port Angeles (37) -- Miki Andrus, Grayson Peet 6, Noah McGoff 6, Nathan Angevine, Hunter Hathaway 10, Luke Angevine 3, Lambros Rogers 8, Bryant Frith 2, Connor Heilman 2, John Boesenburg. 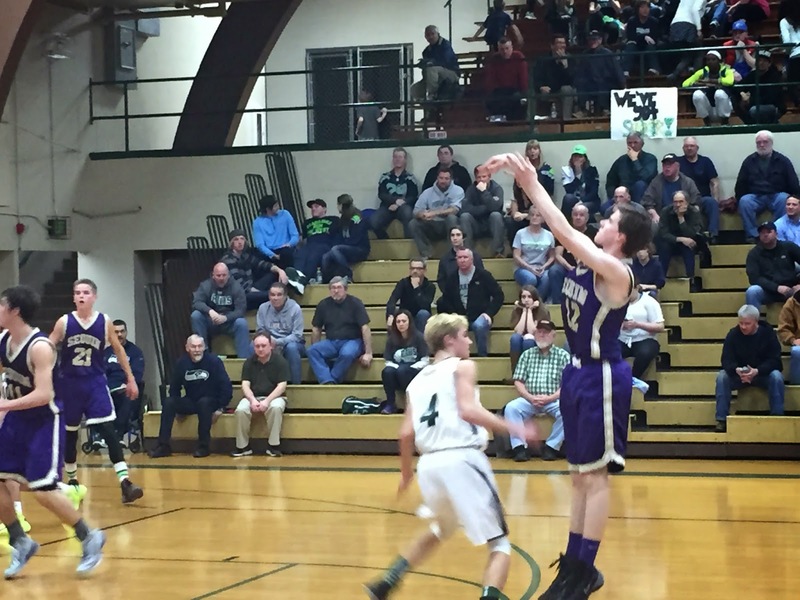 Junior Varsity: Port Angeles 47, Sequim 33.